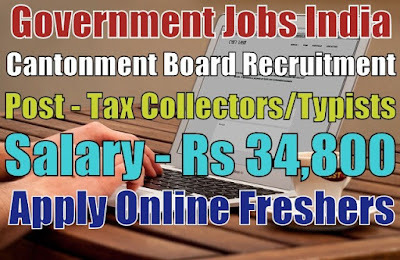 Cantonment Board Recruitment 2019-20 (Ministry of Defence, Government Jobs in India) notification for 17 junior clerk posts. All legible and interested candidates can apply on or before (11-05-2019). 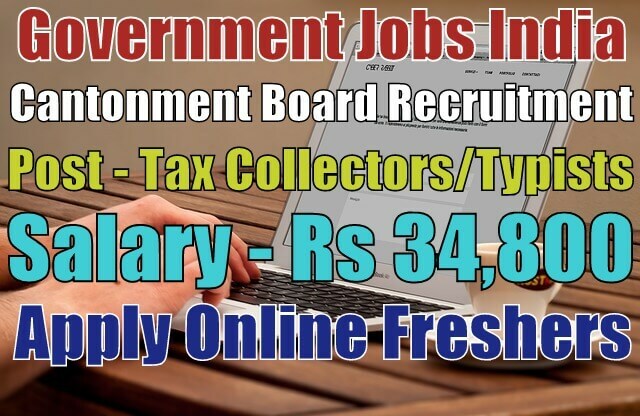 Further information about the Cantonment Board recruitment courses and exams, vacancies, salary details, CB careers, application fee, cantonment board government jobs in India, educational qualifications and all other details/information about this post is mentioned in detail below. Salary/Pay and Grade Pay - For MHS post, the payable salary will be Rs 10,300 - 34,800 with Rs 4,200 grade pay, for tax collector, forest guard, teacher and typist posts, the payable salary will be Rs 5,910 - 20,200 with Rs 2,000 grade pay and for cleaner post, the payable salary will be Rs 4,900 - 10,680 per month. Further information about salary details is mentioned in the detailed advertisement.